Easy to carry, light weight with angle intelligence. The new ZIR10X Laser Rangerfinder from Halo Optics is a well-engineered 1000-yard model that offers true long-range capability. This rangefinder delivers exceptional value. The Halo ballistic Zir1000 has maximum range of 1000 yards and 6x magnification. Dusk/dawn display mode makes it easier to range your target in low light. Ai technology compensates for angled shots. Precise to +-1 yard. Operates on (1) CR2 battery (included). includes nylon case. Whether your on the golf course or in a Tree stand, the Halo zir10x is the perfect tool to have in your bag. Halo Optics has a reputation for consistently pushing the envelope and delivering the most technologically advanced models on the market. 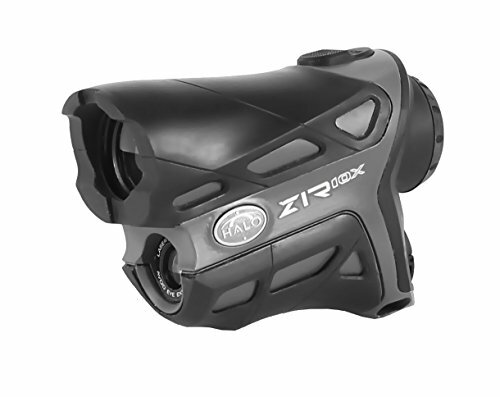 And despite its moderate price point, the new hand-held ZIR10X model is no exception. With 6x magnification, the most serious hunters and shooters can depend on a clear view of targets in a wide range of light conditions and at varying distances. Not only does the Halo ZIR10X deliver accuracy to + / – one yard, it automatically detects and compensates for elevation changes using angle intelligence technology. As result, you’ll see a true ballistic distance on your display. The display is an easy-to-read, color LCD screen with both dusk and dawn display modes. Even in low-light conditions, you’re able to clearly see the reticle, battery status, mode setting, numerical display and unit of measure, which is selectable by yards or meters. The ZIR10X comes in a water-resistant, dual-density housing built to withstand the most rugged conditions. It’s Soft Touch grip extends which extends over the objective lens is designed to minimize glare. One of the most useful features that really adds value to this Halo Rangefinder is it’s ability to range targets in two modes. The standard mode outputs a precise distance reading with a single push of the button. But if you’d like to quickly scan multiple targets, the convenient scan mode allows you to without having to reactivate the laser in between. If you’ve been searching for an affordable rangefinder that delivers both quality and performance, Halo’s new ZIR10X model might be your answer. The Halo ballistic Zir1000 has maximum range of 1000 yards and 6x magnification. Dusk/dawn display mode makes it easier to range your target in low light. Ai technology compensates for angled shots.